The Priya Varrier Phenomenon: What's in it for brands? How best can marketers leverage this sort of here-today-gone-tomorrow digital fame? For decades, Bollywood celebs and cricketers were the only go-to faces for brands looking for famous ambassadors. In the recent past, the YouTuber, the social influencer and the comedian entered the mix - they are the kind who have built an online following over time and are popular in certain types of online circles. They have begun charging brands a premium for the specialised audience they attract and their limited-yet-loyal digital fandom comes with the promise to grow. Will they become legends in their space and last as long as an A-lister from feature films might? Perhaps not, but they're here to stay, for the short-term at least. Enter the third kind of 'face' or let's call it the Priya Varrier phenomenon. The Malayali actor became an overnight 'national crush' after a song from her upcoming Malayali movie 'Oru Adaar Love' went viral. People couldn't get enough of her naughty expressions in the video and her following on social media and overall 'online equity' catapulted in a matter of days. For a day or so, just like that, Priya Varrier became a widely 'searched' name on Google. So what can we call this third kind of 'celebrity'? They become viral sensations extremely fast and their instant and often inexplicable, fame is not expected to last. It's like a Diwali rocket - it shoots up in a few seconds, lights up the sky and disappears with no trace of ever having been up there at all. Sure, she might go on to become a famous actor and get brand endorsements as 'Priya Varrier the movie star', but we're talking about the longevity of her current digital glory. We're talking about 'Priya Varrier, the digital sensation'. Recently, Kellogg's rode the buzz around Priya; as part of the brand's timely campaign, she posted a picture of herself eating Pringles on social media with the copy: 'So many Valentines requests but I'm staying #SingleAsAPringle because I'm just Puurrfect. Pringles'. How much do brands benefit by doing timely, opportunistic campaigns that are not around the flavour of the season but of the moment (a season is too long for this sort of fizzy glory that might vanish in a few days)? What does an association with this kind of short-lived fame do for brands that typically seek long-term, more sustainable equity? And how best can a brand leverage this sort of fame? Not to mention the speed at which a brand would have to work - a campaign that features Priya would have to be made and released in record time, wouldn't it? Lastly, what kind of brand/segment will benefit most by associating with the 'Priya Varriers' of the internet? I believe celebrity endorsements work well for a brand only when there is strong and sustained synergy between their core equities. I strongly doubt powerful brands can be built by associating erratically with these 'flavours of the season'. Yes, one can have a strategy of finding a sustained linkage with whoever is hot for that particular month or week. But to imagine a one-off association with someone who has just hit the 'Viral circuit' may help in enhancing a brand's equity or salience but is seriously undermining your ability at building brands. Varrier is a nine-day wonder. Andy Warhol once said that in the future, everyone will be famous for 15 minutes. That's absolutely true in the digital landscape. Those are the kind of timelines we are talking about. You are a sensation without longevity. Therefore, it makes sense for them to operate with that kind of speed because they know that the window that they have to take advantage of for a phenomenon like this is very short. They have to maximise leverage for maximum impact in a very short period of time. These are not really strategic moves. You are not looking at it as a long-term fit with that phenomenon; you are looking for very quick eyeballs and some instant association till the next one comes along. You are not creating a long time property. Earlier, if you were thinking about a brand ambassador, you would agonise over it for months because you wanted someone to personify your brand. It is because you were looking at that ambassador to take your brand forward for at least a couple of years and now they are talking in terms of days. 'Viral Stars' are an important part of the current social fabric in India. With an average urban Indian spending over 5 per cent of their day on social media channels and consuming content, these celebs can help a brand stay contextual and contemporary if their TG is online and consuming the content from these celebs. An ideal way for a brand or agency to analyse them is to find out their TG overlap with the set of folks who are consuming content from these viral stars. It's important to stay relevant and contemporary with digital celebs. As a brand, you need to ride the wave when their popularity is at a high vs later, when they are out of sight. One thing to scan for is that these stars should not have a controversial social media profile and if you believe doing a short-term engagement will get you eyeballs with your TG, go for it! If this is for a short-term engagement then any brand can take advantage if they are able to build relevant content, though Impulse purchases can benefit the most as the viral stars can drive immediate action from viewers. What the brands are able to do with the short-termness is completely left to the brand. Here, if you are taking one person for a particular term, your question should be - how long should the term be? It should be the other way around, how much can you use that person and in how many ways? So I don't think a celebrity should be signed on for anything less than a year or two because it is very difficult to sustain and by the time you have got on-ground to put up some kind of activation, you have lost about three to four months. A brand can't cash in (for a long period) because the popularity is very short lived. Yes, they can have images to cash in on immediately on a social media platform, but you can't build a brand on something which has got instantaneous engagement. It is going to be short-lived and not a long-term strategy. The brand needs to spot an opportunity, figure out the relevance and take it to the relevant medium, but you can't have a long-term strategy on the basis of something that is short-lived. It depends on how creatively the brand figures out the proposition at that point in time. It depends on multiple factors like TG, mediums and how the brand can come up with a good digital strategy at that moment. It is a combination of various factors that come into play. The digital medium has given rise to 'FlashStars' - they dazzle in and fade out... super-fast. 'Alex from Target' was the rage of the week some time ago but blew into oblivion soon after. We have to wait for the 'winking Priya' to stand the test after her one-day-wonder following. While the imagery and following of traditional celebs, be it cricketers or movie stars, is built over time (movies or matches), thereby becoming the face of brands, FlashStars, given the nature of the medium, fast-forward the wave; super-fast and super-fade. The terms of engagement in the digital medium demand brands to closely follow such instant attractions and build on them; best if its kept relevant or as a topical catch. 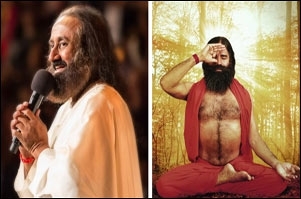 What's your advice to Sri Sri Ravi Shankar as he takes on Patanjali? What happens to brand recall when the same celebrity appears in six different ads back-to-back? Does Instagram's new logo click?